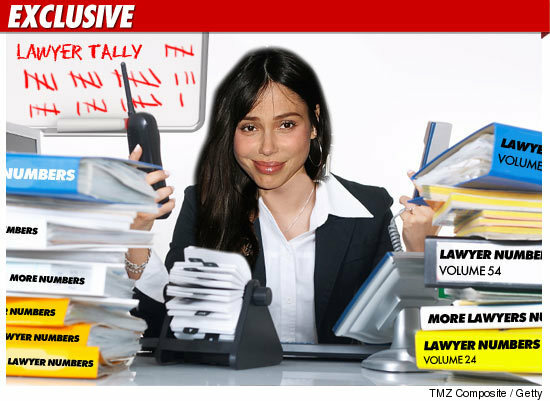 TMZ has learned ... Oksana Grigorieva -- who has said she doesn't have the power to fight the Mel Gibson machine -- has hired a grand total of 39 (THIRTY-NINE) lawyers so far ... to wage legal war on her behalf. All 39 lawyers have been doing legal work for Oksana in her fight with Mel. Even more shocking, we know at least 18 of the 39 lawyers have submitted more than $1 million in legal bills to the court ... and they're asking the judge to make Mel pay the tab. As for the 39 lawyers who have jumped on board team Oksana, they include: Lisa Bloom, Martin Garbus, Daniel Horowitz, Eric George, Sonia Lee, Robin Sax, John Carlson, James Spertus, Ezra Landes, Mary Fulginiti, Amy Hinkley, Dan O'Malley, Suzie Obeda and Amanda Touchton. But there's more ... the firm of Trope and Trope has put the following lawyers on Oksana's case: Sorrell Trope, Anne Kiley, Angela Harris, Bret Hunter, Hillary Slevin, James Durant, John Ellis, Jennifer Leong, Jonathan Pakravan, Katie Heersema, Lori Howe, Melanie Shornick, Mark Patt, Sophie Bidet, Sarah Luetto, Thomas Dunlap and Tara Scott. And, the firm of Freid and Goldsman have put the following lawyers on Team Oksana: Manley Freid, Gary Cohen, Marci Levine, Janet Kaplan, Cori Steinberg, Susan Park, Jill Foley Alexander and Kristine Capell. And the irony -- at the moment Oksana has no family law attorney repping her ... almost all of them have either been fired or quit.